Do you use different wallpaper or background colors for dev, production servers? I want to make it easier to distinguish between server's connected via rdp, without draining resources too much. Do any of you use any wallpaper, and if so, can you show any examples? Or do you use a custom desktop background color? Or do you use something like bginfo? We use bginfo, gives a quick overview of everything with a little effort and no expense. Different solid colored backgrounds, and on *nix machines different colored prompts. We have a GPO set on our servers OU that runs a very simple logon script. 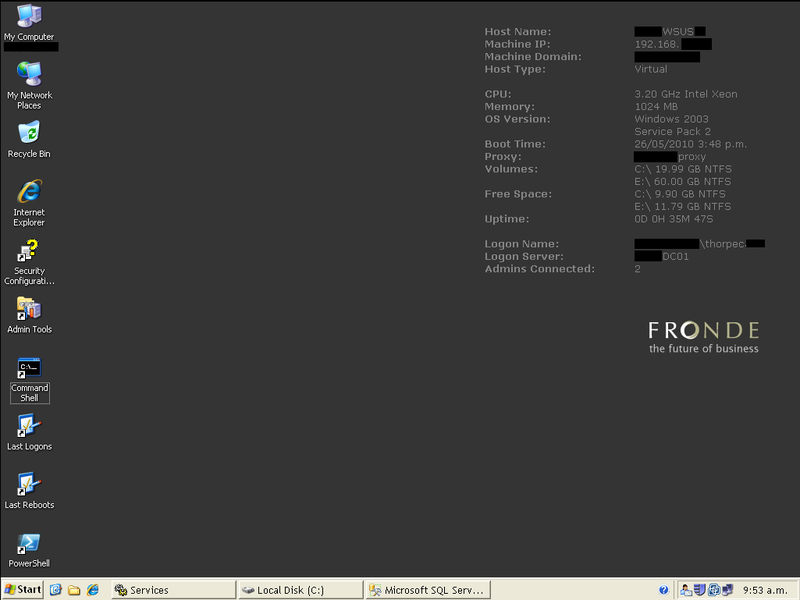 It copies across the BGInfo exe, a logo, a couple of small vbscripts and a template .bgi file. Then it runs the template through BGInfo. The output looks like this. We don't distinguish between dev and prod because that's done via the host names, which are always visible. Number of admins, uptime and host type (physical/virtual) are vbscripts that BGInfo uses when it runs. I can post them up if they're useful to anyone. If your dev/prod/test/uat servers are seperated in AD by OU, or on seperate domains, then jigging a script like this to apply seperate wallpapers would be trivial. Just attach a slightly different script/BGI to each OU. We made simple custom backgrounds for all our servers. Just a simple solid colour background - all the same colour, although this question makes me think that a couple colour codes would be good - and put the server name in large letters on the top of the screen, and in small letters just above the start menu. Most of the time, even if we have windows open on the console, one or the other of the names will be visible. Most of our servers have names based on their function, so the name is a reminder of what the server is for. I primarily administer linux servers, but I give them all different color terminal prompts. E.g. user@hostname ~/current/dir$ in red for production, yellow for test, green for dev, blue for our misc service machines, purple for cloud clients, etc, etc, etc. Anything that helps you associate will do, I doubt you really need a "server wallpaper site". Not the answer you're looking for? Browse other questions tagged windows web-server or ask your own question. How do you make it obvious you are on a production system? How to downsample an image to match a 16-bit color mode for RDP sessions?